Did you know that April is Jazz Appreciation Month? Also happening on April 30th is International Jazz Day. What better way to celebrate than with a song! 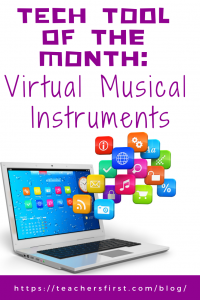 In honor of jazz and music, this month we are featuring a cool tech tool that offers you the opportunity to play music: Virtual Musical Instruments. Explore the parts and sounds of the guitar, pan flute, drums, piano, bongos, and even a guitar tuner. To use the site, click on the instrument of your choice. Learn how to use the instruments, as you type (or touch) the keys on your device. While you don’t play the actual instruments, this site does offer a good introduction to various instruments, just by clicking your keys. You can create music with a touch of the button(s). Use this tool to play different notes and create unique melodies. Practice rhythm and create a tune. Please note that there isn’t a recording option on the site. Solve this issue easily by using your cell phone or another recording device to record. Every teacher can have the magic of music in their classroom. Use this tool during science as you talk about sound. In music class, students can explore the different instruments and rhythms they can produce. Challenge students to work with partners to create an original musical composition. During language arts class have students determine the instruments, rhythms, and sounds needed to create a mood while reading literature. Students could also add their own original compositions to a Readers’ Theater story/script. Students can even tell a story just using music: create a mood and see if the class can guess what the students were trying to convey through their chosen melody and tone. Determine a melody to represent each of the main characters in a story. Challenge students to write and explain why that particular tone/mood of music works with that character. Have students create a melody to use as a writing prompt. What is the story they hear in the music? What is the message? What does the tone convey? Repurpose your math lessons by including music! What a great segway into fractions, using the various types of notes: whole note, half note, quarter note, and eighth note. Have your students create a personal melody to represent their own lives/feelings. Once the melody is created, have students write a story about why they chose the music that they did. Consider playing/sharing the musical creations on a tool like Flipgrid (TeachersFirst review). 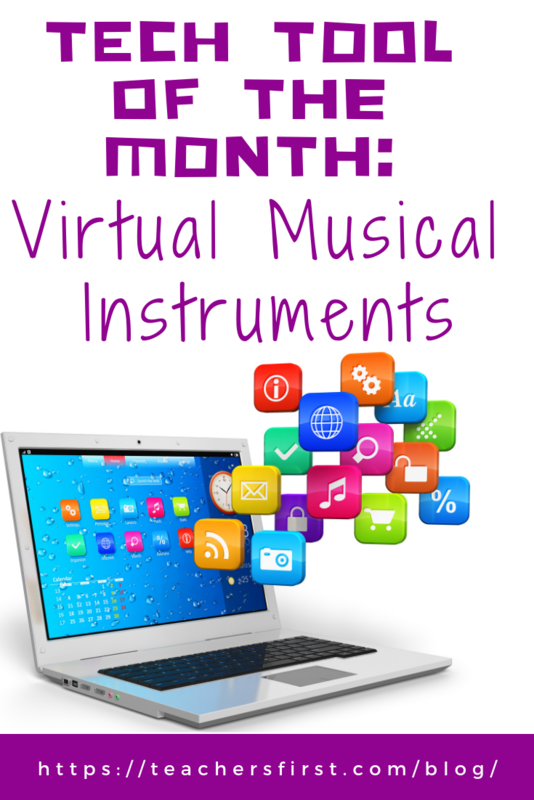 For even more ideas, see the Virtual Musical Instruments TeachersFirst Review.